Creek Side Cabin is an adorable cabin right on Lake Superior just a short drive to the Temperance River, the Sawbill Trail, Carlton Peak and more. Idyllic vacation home near Schroeder, MN, just steps away from Lake Superior. Creek Side Cabin is a quaint log-sided cabin just steps away from Lake Superior near Schroeder, MN. This small one bedroom, one bathroom cabin is ideal for a private retreat or getaway for two. Creek Side Cabin is located on a unique, private section of cobblestone beach. Enjoy summertime visitors at this quiet Lake Superior retreat. The living area of the home is small but cozy. Fireplace is not usable. The kitchen is small but well equipped, with everything you need to prepare a meal. Enjoy your meals at the table- perfect for a romantic dinner for you. You`ll love dining in front of the large lake-facing window. Wave to your visitors from the table window. Small, but quaint, and definitely cozy The bedroom has two twin Captain`s beds. Perfect for a retreat for one or a getaway for two. The bathroom has a walk-in shower. The view from the front deck. With only one neighbor nearby, Superior Reflections 2, actually you still have a lot of privacy. Creek Side Cabin is a very popular summertime rental, located on the shores of Lake Superior. Take the short stairscase down to your private section of cobblestone beach. On a warm summer day you can enjoy a meal on the picnic table outside. Creek Side Cabin on Lake Superior is perfect for a solo trip or a cozy getaway for two. This adorable log home has been completely renovated to create an idyllic North Shore retreat. The water's edge, deck, and spectacular view make this property a rare treat. The shoreline is the perfect place to sit and while the day away or try your hand at agate hunting. Creek Side Cabin is a one bedroom, one bathroom cabin located on one level. It boasts a lovely deck and a rare and beautiful section of cobblestone shoreline. Once you've come for a visit you'll want to keep coming back year after year. At Creek Side Cabin you are just a short drive away from many area attractions. Temperance River State Park is practically in your back yard, with miles of hiking trails and beautiful waterfalls. Also, nearby you will find mountain biking trails, scenic overlooks, and much, much more! Hungry for a bite to eat? Hop in the car and head up the shore and check out some of the great resort restaurants in Lutsen, including the Bluefin Grille at Bluefin Bay, Lakeside Dining Room and Poplar River Pub at Lutsen Resort, Moguls Grille & Tap Room at Caribou Highlands Resort, and Papa Charlie's Grill & Tavern at Eagle Ridge Resort. Each features live music from popular local artists throughout the summer. Of course, if your goal is to get away from it all and just relax, you've come to the right place. Sit out on the rocks and look out over Lake Superior. Listen to the waves roll in on the cobblestone beach. Lie out on the beach at night and look for shooting stars. Once you're here, you'll never want to leave. This is a seasonal cabin open May through October. Everyone was so so nice. Excellent customer service. The house is so beautiful and relaxing. This is our second time staying here and we will definitely be back. I couldn't ask for more from a North Shore cabin. Being right on Lake Superior is so relaxing. Loved all the books too. Would like to know the history of the cabin. We had a lovely stay at the Creekside Cabin! You can't get much closer to the Grand Lake and the crashing waves are like a lullaby every night. Really liked the appointments and pine from floor to ceiling. A couple of suggestions: 1. Get rid of those cheap throw rugs . they're very easy to trip on. 2. Give folks a heads-up on the rancid tap water it's undrinkable. Location, location, location. This sweet cabin is truly a blessing. Upon arrival, youre greeted with a field of natural lupin, taking your breath away. Next appears the immensity of the lake & its waves crashing against the shore, dousing your spirit with peace and tranquility. This property boasts of an opportunity to embrace the simple things. Everything done online appreciated emails with check in information. The location and proximity to Lake Superior are this property's greatest assets. Having a private beach to view the sunrise every morning and sitting by the shore for wave therapy is truly inspirational. It is important to advise people to bring their own drinking water as the faucet water is not drinkable. The fireplace is out of order and the temperature dropped into the 30's. The cabin is well stocked and beautifully decorated. Views of the lake from the cabin are wonderful. Thank you. The location could hardly be better; we felt like we were on a boat sometimes because of the view of the lake. Very cozy cabin, nice porch and having a beach was perfect. Only minor drawbacks were the twin beds and that the water was super hard. Not good for coffee or tea. All online, and all was very clear to us. Great little property and being so close to Lake Superior, could not get any closer! Nice area on the beach for a campfire, if the waves were not huge, like they were for a day or 2. But awesome to watch. Beautiful scenery every window, flowers or the lake. Loved staying at this cabin! The area is beautiful and we had lots of fun swimming and hiking. We needed someone to come out and fix our hot water heater, and it was done that day. The only thing I didn't like was that the water tasted awful. We ended up buying a couple gallons of water to drink because the well water was salty and unpleasant. Otherwise everything was great. Creek Side Cabin was exactly what we were looking for - peace and privacy. We didn't mind not being connected, although we had some internet via our phone. As a small business owner, things can happen at home - which it did of course. So some connection via internet is essential. There were a couple of things that were disappointing given the amount we paid for this place. We had to turn on circuit breakers on the outside of the cabin. It was difficult because of the overgrowth of weeds all around the cabin. The picnic table was also really unusable because of the weeds. So my recommendation would be to mow at least around the perimeter of the cabin and around the picnic table. The only other complaint that I had was that the linens on the bed could have been fresher. The sheets were worn and the comforters were not clean. Again, this place was perfect otherwise and we will look forward to coming back. We were very impressed with the lay out and how well equipped this cabin was for the small size. It was just delightful! We love the Creekside Cabin. It is quaint, private, right on the shore, and is the perfect getaway for a couple. The location is great for nearby hiking, biking and a short 30 minute drive to Grand Marais. The kitchenette provides everything we needed to cook some meals. We have stayed two years in a row to celebrate our anniversary and plan to come back again. The North Shore is one of our favorite places to visit and Creekside is a lovely little gem! 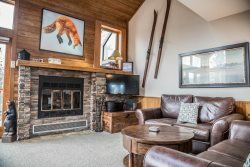 The location of this home was perfect for my son and I. Waking up right on Lake Superior really starts your day right.The home is So close to many different hiking trails,and restaurants. We enjoyed using the grill and eating at the picnic table. The home is beautifully decorated and I enjoyed the many books on Lake Superior. I also liked that there was a binder full of information about everything that area of Minnesota had to offer. Sitting on the shores of Lake Superior just steps from where you're staying was our favorite part of this home. We will definitely be back. We absolutely loved the cabin! The location is fantastic - very private and right on the shore. The cabin was immaculately clean, well decorated and furnished. It was equipped with everything we needed to do some light cooking and the dining table nook is awesome with the windows overlooking the lake. Rock picking on the shore was a highlight! The only thing we would change, possibly, would be the single beds, which for a couple is not ideal. With that said however, the bedroom area is quite lovely and it worked out just fine for us.